It's not to early to think about what gifts you might offer from your kitchen this holiday season. 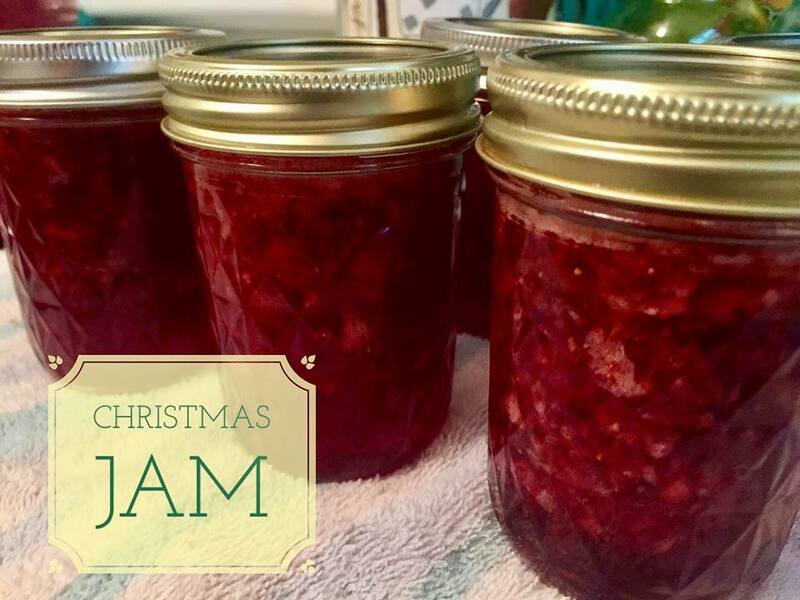 Mr Mom and I made this wonderful jam, and it has been a hit with those we've shared it with so far. Combine the strawberries and cranberries in a food processor and pulse until desired consistency is reached. I like mine with some texture so I stopped when they were chunky. Others might prefer to a smoother jam -- if so, process until smooth. Pour the fruit into a large pot (I used my dutch oven) and add sugar. Allow the sugar to dissolve over medium high heat, stirring, occasionally. Bring to a boil for one minute. Remove the pot from the stove, and add the liquid pectin, stirring to combine. Allow the jam to cool for 5 minutes, and then skim the foam off of the top. Spoon the hot jam mixture into prepared (sterile) jars, leaving 1/4 inch of headspace. Wipe the rims of the jar if needed, then cover with hot lids and bands. Be sure to just hand tighten the lids. Process in a hot water bath for ten minutes. Makes approx 15 1/2 pint jars.